A Treadle feeder is an automatic feeder for fowl. 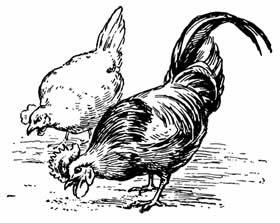 The shutter of the feeder opens as soon as the chicken or other fowl steps on the treadle. Vermin like rats and mice (or sparrows for that matter) are too light, so the shutter stays closed for them, and the feed stays out of reach. Our treadle feeders can be set in two different position: The heavy position, for large fowl like chickens, ducks or geese, and the light position, enabling bantams and pheasants to open the shutter. 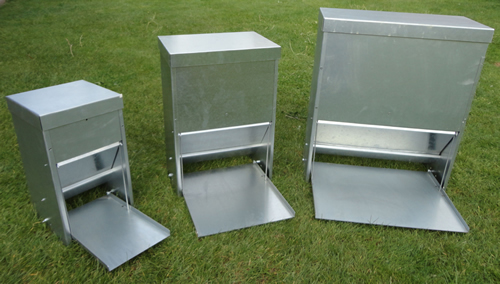 Treadle feeders from treadlefeeder.co.uk are ideal for outside use, they are resistant to any kind of weather. Due to the enclosed space where the feed is contained, neither rain nor sunlight can contaminated the feed. This allows you to feed the birds for several days at a time. All treadle feeders from treadlefeeders.co.uk are made of sound 1 mm galvanised steel, the shutter even has a 2 mm thickness, ensuring high quality , durability and a long lifetime. Due to the smart design these treadle feeders are very stable, strong winds won’t affect them, even when the feeder is empty. The treadle of this feeder is easy to clean with, for instance, a muck scraper. The full metal treadle prevents manure accumulating underneath it, unlike feeders that use the cheaper mesh wire treadle. The raised sides of the treadle provide it with extra rigidity, so it won't bend even if several heavy birds stand on it at the same time.